Now, everyone who knows me knows I am a quilter. I’m not a garment sewer, and I’m not very familiar with craft project sewing, but I still get asked to sew some weird things! I know all sewists do! (Side note: What are we calling ourselves these days… ‘sewers’ or ‘sewists’?) A lot of people have all of a sudden lit up when I told them I sew, and then immediately ask for strange things to be made! What about you guys and gals? 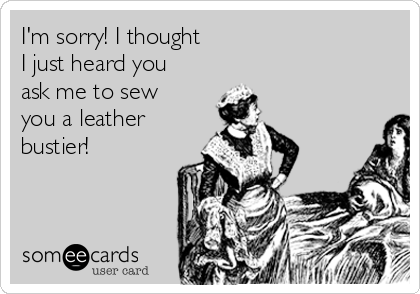 What have you all been asked to sew? Here is a list of Top 10 Things I have been asked to sew! I was once doing some piecework for a purse designer. She had me make a bag out of artificial turf, yes that plastic fake grass. Very scratchy stuff to work with. That gig did not last long. The next one was sewing costumes for plays. I made a huge multicolor coat for Joseph.